Many IT organizations find themselves dealing with storage sprawl which results in an infrastructure that is difficult to manage, often underutilized and frequently escalating in cost. Much of this has to do with virtualization and the ensuing increase in storage systems required to support virtualized environments. Another factor is the increasing pressure IT is under to meet the urgent business needs of the day. Some refer to this as being “agile,” but it often reflects the IT organization’s limited bandwidth to think about the organization’s storage needs more strategically. to go from storage sprawl to storage spry. In order to consolidate down onto one platform, you need a system that can deliver and sustain high levels of performance across mixed and consolidated workloads. This is essential because in a consolidated model, you no longer have highly specialized solutions for any one of your workload environments. That means a flexible solution that can easily adapt to different workloads within a single environment, while continually delivering high performance, is required. When you consolidate more workloads onto a single platform, the need for reliability becomes equalized across the different workloads. And it’s the most critical workloads that will set the bar for the levels of reliability that are required for all. In effect, your fault domain decreases meaning that component reliability and systems reliability of the highest possible levels become of paramount importance. Next, look for a platform that enables greater storage utilization without driving up costs with expensive storage services. In environments where a lot of storage sprawl exists, you tend to get very low levels of utilization and that’s because you have workloads that are very targeted at specific platforms. You end up with a lot of waste because you have systems that aren’t being used to their fullest capacity which, in turn, drives up your costs. The next thing to consider is density. We all know that space in the data center is at a premium. In order to alleviate costs, it helps to have a system with high areal density. And that’s because the more data you can store in a single floor tile, and the lower the power consumption ratio, the more favorable consolidation becomes from a dollars and cents perspective. 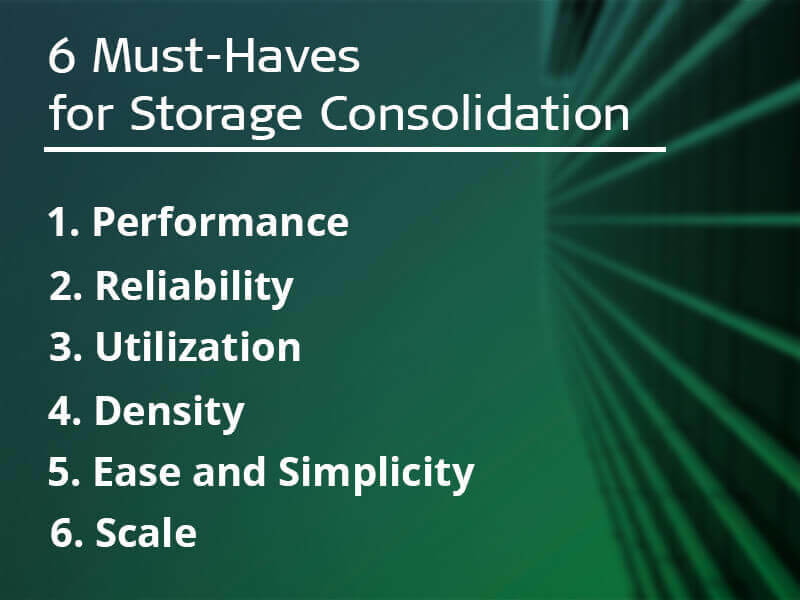 In addition to realizing efficiency and productivity gains, you’ll also want to make sure that the platform simplifies overall storage administration. You’ll want to minimize the amount of training that is required so IT staff can get up and running quickly. Additionally, leaving an environment of multiple, disparate platforms behind will cut down on overall management complexity resulting in added efficiencies over time. Last, but not least, is scale. You’ll need a system that can handle large volumes of data and large working set sizes because as you consolidate onto a single platform in a mixed workload environment, you’ll have working set sizes that really run the gamut from less than a terabyte to multiple petabytes depending on the application. Another important thing to note is that you need to be able to scale in both performance and capacity. Not only that, you’ll need to be able to scale those aspects independently of one another in order to tailor the environment to suit your workload mix which will inevitably change over time. Christie is Senior Director of Marketing Communications for INFINIDAT. Prior to joining INFINIDAT, she led corporate marketing for IT management software company, Kaseya, and supported Oracle’s web experience management solution, WebCenter Sites, in a product marketing role. Christie was responsible for marketing and analyst relations at FatWire Software prior to its acquisition by Oracle. She has over fifteen years of experience as a business-to-business marketer specializing in AR/PR, branding and creative, content marketing, digital marketing, and demand generation for complex sales.